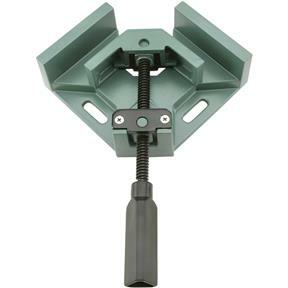 Quick, one-handed operation and rugged cast aluminum construction make this 2-3/8" capacity 90 degree miter clamp a sure winner. 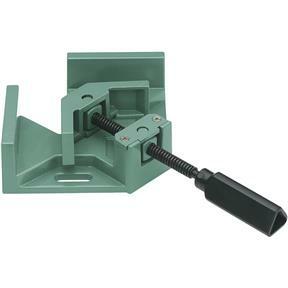 Dependable pivoting clamp head ensures that your corners will stay strong and secure. Open corners provide plenty of access to your work to allow convenient stapling or nailing. Cast mounting holes make bench attachment a breeze. Does an excellent job of holding corners square. Highly recommend. Excelente compra, estoy muy complacido sobre todo por la atencion proporcionada por ustedes en todos los aspectos. Espero hacer pronto nuevas compras. I bought these clamps to build large wooden frames for screens to enclose a porch. They are rugged enough to hold long pieces of wood in perfect alignment. The open design at the junction point allowed for easy fastening. It would also allow for good welding. 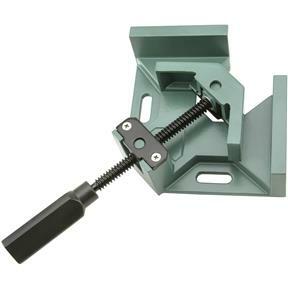 The only deficiency is that there is not a quick release on the screw of the clamp. But for the price of this Grizzly clamp, I am very able to take the few extra seconds to loosen the clamp by turning the handle.